The new album from singer/songwriter/multi-instrumentalist Zsuzsanna Eva Ward, better known as ZZ Ward is an amalgam of all things blues, alt-rock, R&B, Americana, smokiness, and swamp. The Storm brings all that together in an 11 song album that works. If you're a regular reader, you know I prefer interesting and unique. Starting with Ward's voice, this whole album encompasses both interesting and unique. It's not hard to tell when an artist is making music they want to make and when an artist is going through the motions. The Storm is the former, bringing in all of Ward's influences in which every song feels like she means what she's singing and the instrumentation backs it up, whether sparse or layered or anywhere in between. The 11th song, a bonus track from "Cars 3", is a fun song featuring Gary Clark, Jr. How can that be bad? All in all, The Storm is a complete album. There's some fun, there's some heavy, there's some heartbreak, there's some snark and sass. 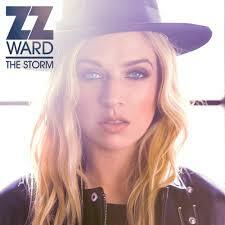 And there is lots of ZZ Ward.